This week I have been putting a Kenwood kMix food processor through its paces. I've never bought a food processor before because let's be honest, they're a bit on the ugly side! I really can't be bothered with equipment that I have to put away after use, so I tend to go for items that are stylish enough to leave on show. Kenwood seem to have cottoned onto the fact that people want sleek appliances which match their decor and perform multiple tasks well. If you have a kMix stand mixer, this will match perfectly, otherwise it still looks good alone. So what does it do? It slices, grates, whisks, dices and kneads. Basically, that's pretty much all of your cooking and baking needs sorted then! I'm unlikely to use this to make cakes as I have two stand mixers to choose from, so realistically this is going to get used for more 'choppy' tasks, such as pastry and slicing vegetables. If you're making something like a stew, you can use either the knife blade or the thick chopper for slicing. It's got a nice big bowl too, so there's no need to chop in batches. As with their Titanium Chef, it's got a strong motor and the speed dial allows more control than your normal on/off/pulse models. I imagine this product will come into its own for making things like coleslaw, soups, sweet pastries and decorative salads. Cleaning is also pretty easy, although some of the attachments are a little fiddly. 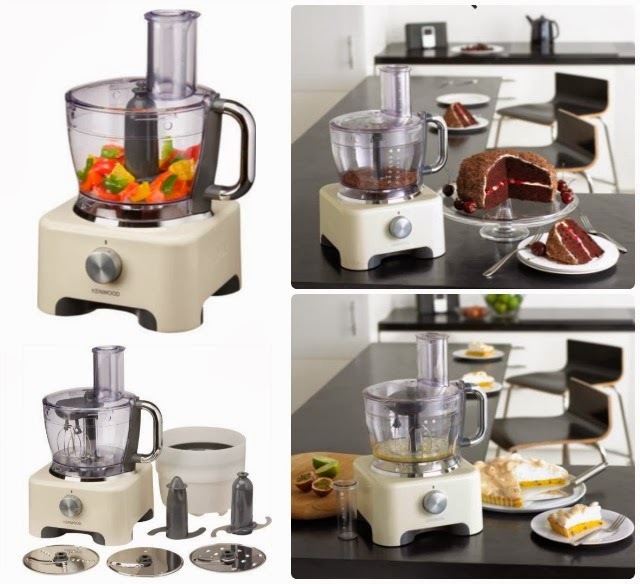 At £199.99 it's not cheap, but then it is made by Kenwood so you can be assured of quality. The plastic bowl is sturdy (and crack resistent), the mechanisms feel strong, and the sharp British design is exactly what you would expect. It's just how I imagined! Colour: Almond (cream). Also available in red and black. Argos have large ranges of Kenwood appliances available to buy here. Disclosure: This post was written in association with Argos. I was not paid to say these nice things, but did receive a food processor to test. This is so useful, I'm looking for a food processor for my new kitchen, I have a cream KMix stand mixer & do rather like matchy matchy! Definitely at the top of my list now!